Stacey’s cycle was off-kilter last month, and when we couldn’t ignore it any longer, we made a big step and bought a pregnancy test. Every marriage has a few memorable “freak-out” moments, and taking this test was one of them: Stacey was pregnant. To say the bare minimum, this raised a whole host of questions for us. We’ve been successfully practicing Natural Family Planning (NFP) to both postpone and achieve pregnancy for our whole marriage. With three kids all of school age, we are decidedly using NFP to postpone pregnancy right now. We’ve been priding ourselves on having paid our dues in the infant/toddler years, and are enjoying the fact that our children can do some things on their own, like take themselves to the bathroom and make themselves toast. It was more than a little overwhelming to consider how this development would change the trajectory of our lives. We no longer own a stroller, infant car seat, crib, diapers, high chair, etc. I began to notice babies and toddlers everywhere—crying in Church, laughing on a playground, throwing a fit in a store. This was going to be our world again soon. And though it was confusing, it was also just as exciting. It was an immediate infusion of new life into our family. We knew this new life would throw everything upside down, and there was something romantically wild and unruly and holy about that. We were being led in a new and unexpected direction, and it felt like an adventure. From the very start, Stacey and I understood NFP to be, at bottom, about bringing our whole lives—including our sexuality—into cooperation with God’s plan. In an effort to be good stewards of our energy and resources, we have an ongoing conversation about the size of our family. We thought we had that part figured out (though admittedly, we stretched NFP rules slightly in this case), but it turned out that God had something else in mind. We told our children immediately—we wanted them to be a part of this new life from the start. Their reactions to the news spanned the spectrum. Lucy, our youngest, was plain confounded—she couldn’t understand what it meant that she might have a new sibling. Simon, our middle child, was ecstatic—he wanted a younger brother. 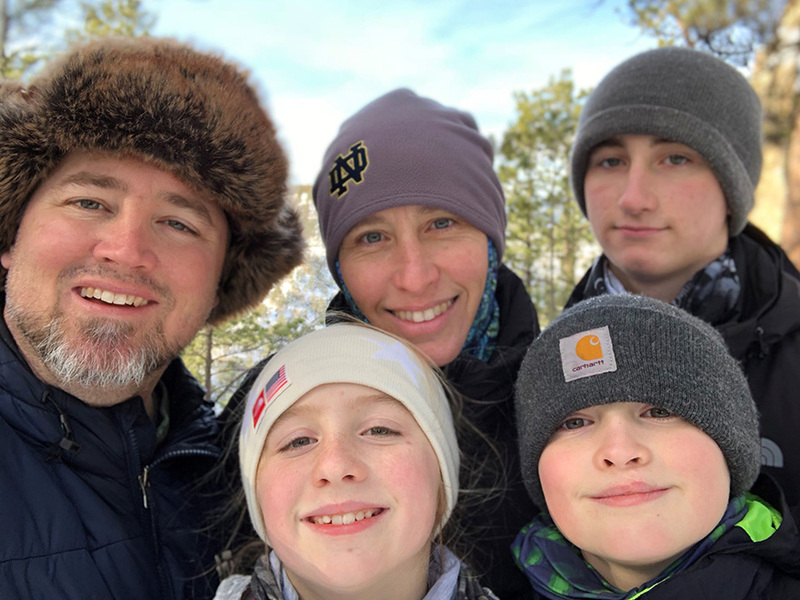 Oscar, our teenager, had mixed feelings—he felt like it was good news, but understood that it would change our family drastically. We told them we felt all of these reactions as well. Looking back, the most important thing in this whole experience remains our conviction that NFP is a way for us to cooperate with God’s plan. When our plan and God’s plan seemed different, we felt anxious but also hopeful because we knew that God is faithful. So we began to prepare our hearts and minds for a new baby. It was one week later when Stacey noticed that her cycle was returning—she was experiencing an early miscarriage. If we had not been practicing NFP and tracking her cycle, we might not have even noticed that the pregnancy had happened. We felt equally relieved and saddened. We told the kids as soon as we were able to, and we all prayed for the little one. We also made a point of having a special night out to celebrate the life that baby brought into our family, even though it was for such a short time. Our dominant feelings about this experience have to do with gratitude and surrender. We remain grateful to have another little one in heaven praying for us, and we continue to appreciate NFP as a tool to help us align our will with God’s will in a responsible way. The experience rekindled our willingness to be led, and to put our lives in God’s hands. We are unafraid to do so because we know that God is faithful.